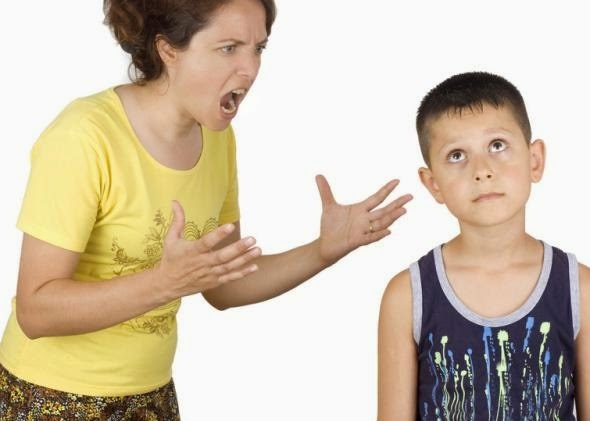 When a child acting up, and you are not patient enough to deal with, it most likely that you will response by yelling angrily. How to restrain angry? Often snapping at a child may give bad effect on the development of child’s attitude. He could imitate you and will often yell either to you or people around him. You certainly do not want kids to be so. For that, you should avoid shouting though you're so angry at him. If the child starts acting up, position yourself as high as your child then you see his eyes. Talk to your child if his manner is not good and should be corrected. Teach how he should behave. This method is more striking in children than you shout to warn him. If above way is not successful and even the child throwing a tantrum, inevitably you have to give him punishment. Ask him to sit in the corner of the penalty for a few minutes, until the emotions of you and him go down. Then just talk nice to him, don’t forget to express your affection for him. Emphasize to three times what he should do. Research shows a person would take seriously a warning if submitted at least three times. Ask also the reason why he changed, so you can figure out the cause. Your child will feel valued and his opinion is listened. It's hard to discipline children.